"Our lives are but a splash of water on a stone. I am the stone they fell upon, and they have marked me." 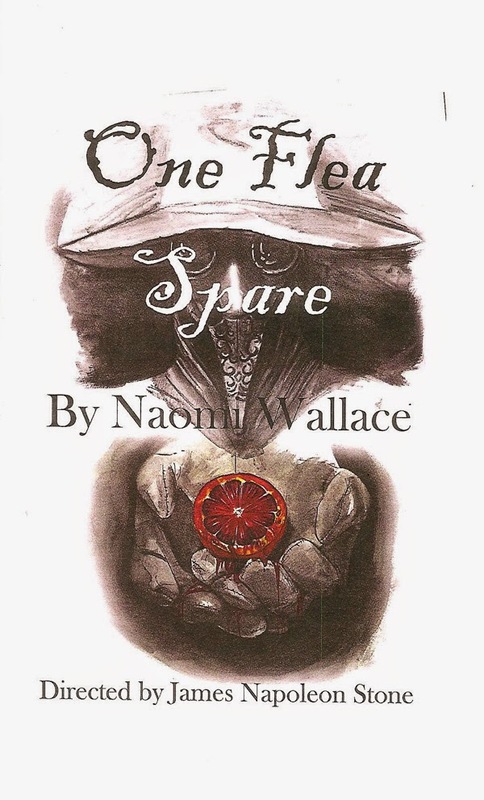 So ends the hauntingly beautiful play One Flea Spare by Naomi Wallace. Theatre Coup D'Etat's production, currently playing in the cold dark basement of The Soap Factory*, an art gallery near St. Anthony Main, is one of those theater experiences that will stay with me long after the lights go up. 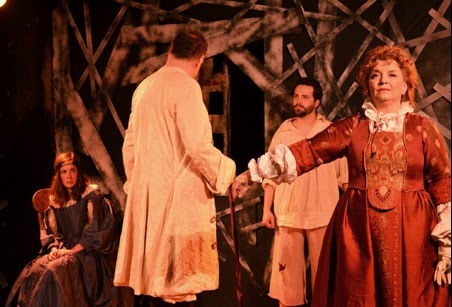 Focusing on four people trapped in a house together in 1665 plague-infested London, the play takes a hard look at who people really are when the everyday distractions of life are removed, and there's nothing left but themselves and each other. It's a harsh but beautiful view of humanity. A 12-year-old girl named Morse begins and ends the story for us. She has broken into her neighbor's home, that of the well-to-do Mr. and Mrs. Snelgrave, after everyone in her home perished from the plague. A sailor named Bunce has also sought refuge in the house, which has all been boarded up except for one room, the only room in which no one has died. After discovering this break-in, the guard Kabe, their only contact with the outside world, has ordered them to say inside for 28 days to ensure none of them are infected. So begins a long process of these strangers getting to know each other, and the long-married couple facing their long-buried issues. We're told by Morse at the beginning of the play that not everyone survives, so we wait to see who dies and how, like a 17th Century deadly version of Survivor. It doesn't get much more intimate than this space, with just a few rows of seats on three sides of the small square that serves as the stage. There's nothing between the audience and the actors, and all of their performances are almost too real. I was completely drawn in by them, almost to the point of feeling uncomfortable as if you're eavesdropping on some very intense conversations. As their true colors begin to show in this small room with nowhere to go and nothing to do, we learn that Mr. Snelgrave is hard and cruel, Mrs. Snelgrave is lonely and suffering from a long-ago hurt, Bunce the sailor is kind and tender-hearted, yet unwilling to tolerate Mr. Snelgrave's classist attitude, Kabe the guard is a selfish opportunist, feeding off the dead, and little Morse is curious and precocious, innocent yet knowing more of the pain of the world than any little girl should. James Napolean Stone does a beautiful job directing this fine cast and so vividly creating this world. As Morse, Briana Patnode is utterly captivating and appealing, with her ever-changing emotions displayed plainly on her open face. Peter Beard's Bunce has a raw intensity boiling just below the surface of his calm demeanor. Ellen Apel is as sympathetic as Mrs. Snelgrave as Jim Ahrens is vicious and appropriately unlikable as her cruel husband. Last but not least Brian Joyce brings the right mix of humor and creepiness to the guard who occasionally shows up at the window. Helping to set the tone is the sparse set by Meagan Kedrowski, which consists of two chairs and one boarded up wall with a window. The surroundings are well-incorporated into the set, most effectively in the concrete floor of the basement that is momentarily marked by the water that is splashed on it, until it drinks it up. The beautiful period costumes by Barb Portinga range from shabby to elegant and help to define the characters (there's even some clothes-swapping as roles are reversed). I particularly loved Morse's too-large dresses, ragged and dragging on the floor. "Our lives are but a splash of water on a stone. I am the stone they fell upon, and they have marked me." And this play has marked me. You can't ask for much more than that from theater - a beautifully written, thought-provoking, disturbing play with wonderfully real and raw performances by the small cast in a space that adds to the tone of the show, that has a lasting impact on the audience. It's playing for two more weekends and I highly recommend that you check it out as one example of the fine work being done by small theater companies in unusual spaces. *It really is chilly in the basement, so bring a sweater. There is street parking around The Soap Factory, but leave a little extra time to drive around and find a spot.